Home > PCB Blog>PCB Manufacturing Technology > Why Is Cem-1 PCB Material still Popular in the Circuit Board Market ? Why Is Cem-1 PCB Material still Popular in the Circuit Board Market ? Cem-1 PCB material ? Is so strange for the most of people , is one of Base Material for printed circuit boards. Is low grade in the PCB material industry , Only for Single side PCB, But it is used very widely . Some People will say Now Technology develop so fast , Every Electronic device become smaller and thinner . Why so low grade material can be use widely . Is true , Technology is becoming higher and higher , but mean time , Components is also high assemblied more function , This will let more designer use single side PCB ( Cem-1 Material ) to control their Cost . 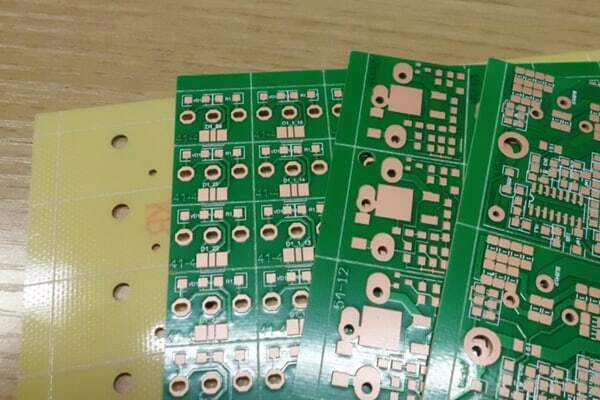 Single Side PCB ( One Layer PCB ) will reduce the design cost very much , that's the most important reason . he materials suitable under the CEM-1 specification in classification of NEMA – the most widespread materials for production of 1-layers printed-circuit boards. Standard CEM-1 material is composite material on a cellulose basis with one layer of glass fibre laminate (FR-4) on a surface. Usually CEM-1 has milky-white color. The feature of this material is the impossibility of realization the metallization through holes, thus, this material can be used only for production of 1-layer printed-circuit boards. Standard CEM-1 satisfies to combustibility class UL94-V0, as FR-4 material. Mechanical characteristics of CEM-1 are little bit worse, than at FR-4: CEM-1 is more fragile. The dielectric constant and a tangent of angle of dielectric losses of both materials are differ insignificantly. Thus, CEM-1 is a cheaper alternative for FR-4 material for production of 1-layer printed-circuit boards. CEM-1 Composite material composed of woven glass fabric surfaces and paper core combined with epoxy resin. Primarily used in the printed circuit board industry. Easy punching and excellent electrical properties and higher flexural strength than paper based grades. CEM-1 provides excellent mechanical and electrical properties, and punches well up to .093″. CEM-3 is very similar to FR4. Instead of woven glass fabric a ‘flies’ type is used. CEM-3 has a milky white color and is very smooth. It is a complete replacement for FR4 and has a very large market share in Asia. It is a kind of flame retardant epoxy copper-clad plate glass material, is generally used in electronics with double sided and multilayer pcb boards. And CEM – 3 is a new printed circuit substrate material developed based on FR – 4. In recent years, CEM-3 is used to replace FR-4 in Japan, even more than the FR – 4 dosage. In Led lighting Market ,Most of Led PCB Manufacturer use Cem1 as base Material . it can give the best balance between The heat dissipating performance and PCB cost . In Next article we will introduce more low grade PCB material for our electronic designer , give a low Cost PCB solution to you . Fr1 . FR2 , FR3, 22F, CEM 1 ,Cem 3 . FR4, FR5, What's difference between them ? How to Choose the suitable material for your design? how to control your PCB cost , Let 's wait the next article coming .